Pass Your ITIL 2011 Foundation Exam! ITIL, or the Information Technology Infrastructure Library, is considered a revolution in technology frameworks. "Great planning and outstanding course material." Purchase our guarantee and get a refund if you don't pass the ITIL exam. 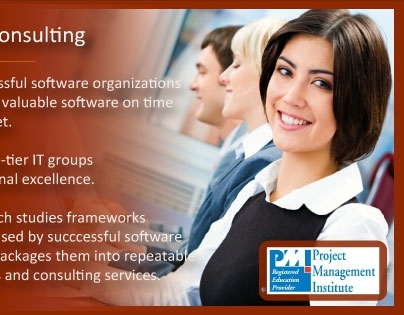 Our instructors are friendly, educated, and have real-world project management experience. Our pass rate for the ITIL is 99%. We have the best guarantee in the industry. 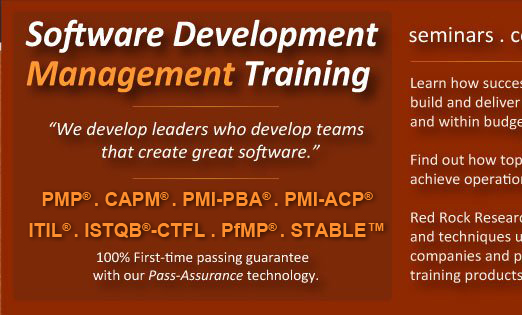 We guarantee you will pass the ITIL exam on the first try. If you can't after two more attempts that we pay for, we'll give you the rest of your money back. After you attend our course once, you are welcome to sit in on our ITIL course at any future time throughout your career. Our ITIL exam prep course contains specialized memory-training exercises novel to Red Rock Research. Attendees will also have access to our on-line test simulator, containing sample test questions similar to the ITIL Certification exam. What are the prerequisites for the ITIL 2011 Foundations Exam? The Foundation level of ITIL has no pre-set requirements. Am I guaranteed to pass the ITIL 2011 Foundation Exam? Red Rock Research offers a first-time passing guarantee for the ITIL exam. This means we guarantee you will pass the test on your first try. The ITIL is a difficult test and we take our guarantee seriously. If you don't pass the test on the first try we will pay for your second attempt. If you don't pass on your second attempt, we will pay for your third attempt. If you don't pass the ITIL on the third try, PMI requires you to wait an entire calendar year before your next attempt, and Red Rock will refined you the cost of the course minus the test we have paid for already. Check our guarantee against others and be sure they give you all of your money back, like we do. We have noted that many other providers keep a 'processing fee' when issuing refunds. What is your pass rate for the ITIL 2011 Foundation Exam? Our official pass rate for the ITIL Exam is 99%. While that is a fact, you need to understand when test prep providers publish this figure they are describing how many participants pass the test within 3 attempts--and not processing a refund. The majority of our students in each class pass the ITIL on the first try. What makes the difference? The amount of time you study! People who study pass the test, people who don't study have to take it over again. What can you tell me about the ITIL 2011 Foundation Exam? The ITIL Exam spans 60 minutes and has 40 multiple-choice questions with four possible answer for each questions. This gives you about 1.5 minutes per questions. How many questions are on the ITIL 2011 Foundation Exam? The ITIL 2011 Foundation Exam has 40 multiple-choice questions. How much time do I have to complete the ITIL 2011 Foundation Exam? You have 60 minutes to complete the ITIL Exam. This translates into 1.5 minutes per question. How many times can I take the ITIL 2011 Foundation Exam? Where in the RENO area can I take the ITIL 2011 Foundation Exam? The ITIL exam can be taken online. How do I schedule my ITIL 2011 Foundation Exam? After registration, instructions will be provided for obtaining an online test time. How much does the ITIL Exam cost? The ITIL Exam presently costs $230. Should I schedule my test before I come to class?s? How can I show people I have passed the ITIL? Is there an official ITIL registry? Yes. There is a public list of ITIL credential holders. You can find it here. What score is needed to pass the ITIL Exam? You need to answer 65% or more of the questions corrent to pass the test. The test is difficult and structured with questions that are extremely tricky. ITIL Posts From Our Blog . . .